Hundreds of students marched through the streets of D.C. on Thursday in the second installment of a region-wide school walkout demanding a solution to gun violence. At 10 a.m. Thursday, students from across the area walked out of classes for the sequel to National Walkout Day, a protest for tougher gun laws organized by Montgomery County student-led group MoCo Students for Change. After a 17-minute sit-in outside the White House’s north gates — one for each victim of the Marjory Stoneman Douglas High School shooting in Parkland, Florida — students set out for a two-mile march down the length of Pennsylvania Avenue to the U.S. Capitol, determined to push legislators to approve a series of bills strengthening background check requirements for firearms. Students from Maryland, Virginia and D.C. joined up for a rally in the shadow of the Capitol rotunda, emboldened by a new Democratic majority in the House and the window of opportunity for Congress to deliver on a long year of advocating for gun control, both in the streets and on Capitol Hill. “Thoughts and prayers are not enough, the Senate needs to step it up,” students chanted on the approach to the Capitol, promising to keep up the pressure on members of Congress from both parties and up the ante on lobbying efforts for comprehensive gun legislation. MoCo Students for Change first convened in the turbulent weeks following the Parkland shooting. Founded and led by high school students, the group was one of several in the D.C. area answering a call from Stoneman Douglas survivors for lawmakers to take action against gun violence. For co-president Dani Miller, a senior at Winston Churchill High School in Potomac, Maryland, organizing a region-wide walkout wasn’t easy. But a desire for change and a team effort with her friends led Miller to rally hundreds to the Capitol for the second time Thursday, jumping logistical hurdles. “Many times, I was convinced this just wasn’t going to happen, that something was going to go wrong because I’m somehow going to mess it up,” Miller told WTOP. Especially for a high school student, pulling together a massive walkout under the gaze of school administrators and parents is no task for the faint of heart. In organizing this year’s event, Miller said, she overcame challenges including “tedious logistics, spreading the word, talking to press and getting each other excited,” despite the risk of an unexcused absence for walking out of class. Last year’s far larger March for Our Lives was bolstered by celebrity endorsements, small fortunes in donations and the burning memory of gun violence still festering in the public conscience only one month after Stoneman Douglas. In the year since, the burden has fallen on smaller student-led groups, including MoCo Students for Change, Students Demand Action NoVa and March for Our Lives D.C., to carry that momentum forward — often entirely on their own, and with limited resources. But through the power of crowdfunding and with guidance from Youth Empower, the Women’s March’s youth advocacy program, local students provided for a full stage setup, sound system and buses to bring students in from Maryland and Virginia. “Young people organizing like this is the definition of grassroots, and that’s the true way to make change,” Miller said. For the dozens of school shootings that have shocked the country and then seemingly disappeared from the limelight just as quickly, Parkland struck some gun-control advocates as the decisive moment to take their demands directly to Congress. One election cycle later, the dynamics are somewhat different. With the Democratic Party surging, a window of opportunity has opened for gun-control advocates — even if the party appears in no rush to turn existing gun rules on their head. But for MoCo Students for Change, the biggest victory so far has been keeping the conversation going. Another feeling persisting well into the new year among students at Thursday’s rally: fear that what happened in Parkland could be in store for their own school. “I’m missing one day of school because hundreds are missing the rest of their lives,” her sign read. Reyes was among hundreds of students sitting beneath a stage on the Capitol’s west lawn on Thursday afternoon, listening intently as fellow student activists and members of Congress took to the podium to speak out against gun violence. Among the speakers were Sens. Richard Blumenthal and Chris Murphy of Connecticut, two prominent members of the Democratic caucus who have expressed support for H.R. 8, a bill that would mandate background checks on all gun purchases, public or private — one of the key changes gun control advocates have sought in the days since Parkland, Santa Fe and Newtown. A Senate vote on H.R. 8 is pending, as are two other bills on enhanced background checks — S. 42 and H.R. 1112 — which MoCo Students for Change see as one sign their campaign is having an impact. 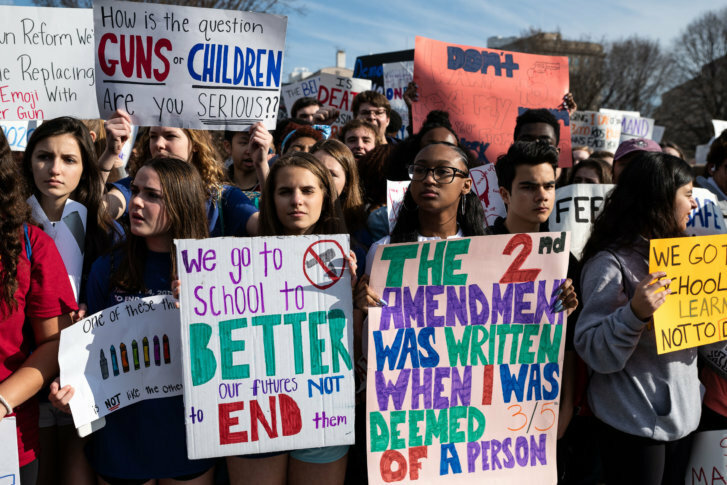 To keep the pressure up, Maryland and Virginia students plan to lobby members of Congress in support of gun control legislation. March for Our Lives D.C. has already announced plans to visit Senate offices in the coming weeks to deliver letters from constituents nationwide in support of universal background checks.